Buddhist praying in Saigon streets. Barbed wire barricade. Loudspeaker cluster. Armed Vietnamese soldiers standing guard in street. Soldiers and Buddhists confront one another at the barbed wire. Firemen spraying high pressure stream of water towards crowd. Vietnamese soldiers throwing canisters of tear gas to disperse demonstrators. People watching demonstration from apartment balconies. Buddhist marching through streets carrying signs and banners. Large crowd of Buddhists and their supporters gather outside the main Buddhist Temple in Saigon. 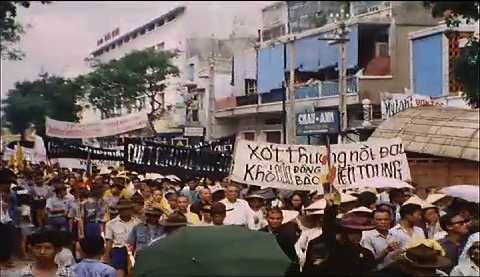 Chicago: “Vietnam: A Television History; Anti KY, Anti American March by Buddhist Demonstrators,” 05/29/1966, WGBH Media Library & Archives, accessed April 25, 2019, http://openvault.wgbh.org/catalog/V_E7E7B5478ED448A688210DDD8DFBA36E. MLA: “Vietnam: A Television History; Anti KY, Anti American March by Buddhist Demonstrators.” 05/29/1966. WGBH Media Library & Archives. Web. April 25, 2019. <http://openvault.wgbh.org/catalog/V_E7E7B5478ED448A688210DDD8DFBA36E>.